All of these are my personal recommendations – a list of some of my Favorite Things. I wish I could go all Oprah and pull out my magic elves and share them with you instantly. But sadly, I do not wield such power. So all I can do is present them as a list of helpful suggestions. This list is authentic – no one asked me or paid me to put them on the list. This post does contain affiliate links. I have included items in all different price ranges in case you’re looking for that one great thing for someone special, or a nifty little gift for everyone in your quilting guild. Notions: Notions are a great gift for quilters. There is always some handy new gadget to make our quilting-lives easier. Here are a few of my favorites. and the OLFA 5-Inch Scissors. I love the Splash because it’s relatively inexpensive, but it’s sturdy, and because it’s SO easy to change the blade. If you don’t have a good rotary cutter PLEASE give yourself the greatest gift and get one. (My favorite are the Olfa’s.) I promise it will make a huge difference. You will thank me and wonder why you waited so long. I received my 5″ Olfa scissors at the Sewing Summit last year and have LOVED them. I keep them by my machine, but I also take them with me on the road because they are small and portable, but super sharp and great for cutting fabric. aka Binding Clips. I have seen and heard talk about these puppies for a long time and finally got some this fall. And I add my love to the love professed by others. They are so handy. And my family walks with much less trepidation and fear of a random pin in the carpet after I have bound a quilt. The one thing that held me back originally was the price, but I found them for a GREAT deal on amazon here. This is called a Wooden Iron. I saw these for the first time this fall at a sewing conference. It’s a tool for quick pressing simple seams without having to get up and use an iron. I don’t have one yet, but they looked so cool – it’s definitely on my wish list. Fabric. Who can resist fabric. Precuts are a great option, but for me part of the fun of getting new fabric, is picking it out myself. I highly recommend Gift Certificates to fabric shops. Pretty much all of the online shops on my side bar (under Sponsors) or your local quilt shop will happily sell you or your loved one a gift certificate. Keep in mind – giving a gift certificate is not a cop out – it’s like giving a present twice. First when they receive it. Second when they use it to buy something they love! Another fun thing for someone who is just getting started would be a membership in a monthly club from online shops such as Pink Castle Fabrics or Westwood Acres where they send you a bundle of fabrics in a new color each month. Perfect for stash building! by Lynne Goldsworthy and Kerry Green. This book is full of so much inspiration. I bought mine a few months ago and it is still on my bedside table because I love to read it just for the fun of it. In addition to all the block patterns and variations there are also some full quilt patterns and other projects. 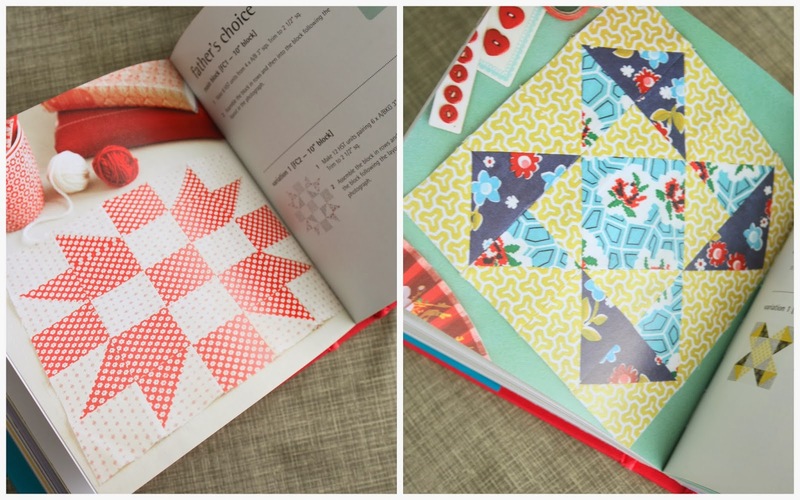 It’s such a sweet book and I think it’s the perfect gift for any quilter on your list because it appeals and crosses over to many tastes and styles – whether they’re new or experienced, traditional or modern. Handmade gifts: Let’s be honest. It’s hard to beat a handmade gift. These are just a few little suggestions of handmade gifts – some simple, some more complex -for quilting friends. A cute zipper pouch is always useful to anyone. (The little piggie pouch was a sweet gift from my friend Leigh.) There are lots of great zipper pouch tutorials. One of my favorites is Anna from Noodlehead’s open-wide zipper pouch tutorial. I also recently tried Anna’s Divided Basket pattern. It takes a little more effort but the results are so great. I LOVE mine – it helps me feel so much more organized to have a place to keep all my supplies together. I can give a great testimonial that it has helped me misplace things far less frequently. I am really hoping to at least make a few of these before Christmas gets here. A little pin cushion made from a small rice bowl is super easy. Or a bunch of these numbered labeling pins. An inexpensive but VERY useful gift. A friend recently sent me some and I LOVE THEM for keeping track of quilt rows, pieces, etc. There is a tutorial for making these quilt row markers here. Another adorable handmade gift is NanaCompany’s Needle Book tutorial. This is one my sweet friend Calli made for me a couple of years ago. I love it so much. This is a fun new addition – I just bought one myself. Charmed Collections has a bunch of cute sewing-themed jewelry charms – perfect for a sewing-loving friend! Finally, a really fun gift would be the gift certificate to take a class, either at a local quilt shop, or online. You can Gift Any Craftsy Class by buying a gift certificate and then let the recipient choose the class that interests them most. Most of these notions are found, not only at big box sewing-supply stores like JoAnn’s, but also at other craft stores like Michael’s or Hobby Lobby. You can use those great weekly coupons to get some great deals on awesome quilting supplies, extra rotary cutter blades, etc. But at the same time please, please remember to support your local quilt shop! You can’t replace the expertise and customer service only found in local shops. If you have other ideas of gifts perfect for quilters, feel free to leave them in the comments. such good ideas – the price on the clips has held me out on those but I use the metal hail clips so I will continue to hold my money out on fabric to use instead. I held out because of the price too. But finally got some with a 50% off coupon at Joann&#39;s. They will change your life!!!! I use mine ALL THE TIME!!!!! Thank you for a most helpful post! I have been thinking about those binding clips…your timing is perfect. I will check out a few of the other items as well! Ha, I have that same book on my bedside table for that same reason!! Great round up there, hope Santa&#39;s good to you! Fantastic list! I plan to use it for myself and for others. Thanks for taking the time to compile this! Great suggestions, Amy – particularly the clips from Amazon. I think I still have time to order a few more stocking stuffers! Amy, I love your gift list! I have some of the supplies, but not all. I really enjoyed reading what you liked about each one 🙂 now I&#39;m inspired! How generous of you to post these ideas for gifts. Thank you so much! Great ideas! I would venture to suggest that this is actually &quot;18 gifts for quilters.&quot; This post made me smile just to look at it. This is the best! Thank you for sharing this super list. I ordered almost all of them for myself and a friend. Thanks, Amy! This is so helpful for Christmas! Thank you for this post. I want to give a quilter that we love, gifts she will love. Sounds like binder clips and the self healing rotating cutting mat will fit the bill. Thanks Amy. As a husband of a quilter, I got some great ideas for Christmas gifts for my wife.